Beautiful Dining Chairs upholstered in Leather or Fabrics. All built with Birch wood frame and legs. Individual and wholesale order available. Customization available with wholesale order. Please visit FAQ for details about wholesale and customization. Free curb side shipping on all orders. White glove service available with additional fees. Please visit "Shipping" for details. 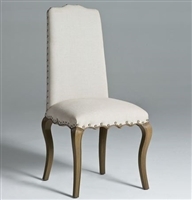 The low back of this Seriena Linen Dining Chair make it a good fit for hotel, restaurant dining. Available in White beige, gray, black, yellow or red linen. Constructed with solid birch wood. Suitable for bars, restaurant, hotel or casual home dining. Customization available with whole sale order. In stock now! Limited quantity so reserve yours today! Dimension: Width 18" x Depth 20" x Height 31" x Seat Height 19.5"
With button tufting and a barrel-curved back, Seriena La Rochelle Dining Chair with linen upholstery will sure add style to your dinner party. Upholstered in white beige linen. Also available in gray Linen. Constructed with solid birch wood. Suitable for home, bars, restaurant and hotel. Minimum order 2 pieces. Fully Assembled. Customization available with wholesale order. Dimension: Width 23" x Depth 24" x Height 37" x Seat Height 19.7"
With button tufting and a barrel-curved back, Seriena La Rochelle Dining Chair with linen upholstery will sure add style to your dinner party. Upholstered in dark gray linen. Constructed with solid birch wood. Suitable for home, bars, restaurant and hotel. Fully assembled. Minimum order 2 pieces. Customization available with wholesale order. Dimension: Width 23" x Depth 24" x Height 37" x Seat Height 19.6"
The highback of this Seriena Linen Dining Chair has a formal feel yet with very simple and elegant design. Available in beige and light gray linen. Constructed with solid birch wood. Suitable for home, bars, restaurant and hotel. Dimension: Width 18" x Depth 24" x Height 41" x Seat Height 20"
The with button tufted back, Seriena Madison Dining Chair is simple and elegant. Available in White beige and gray linen. Constructed with solid birch wood. Suitable for home, bars, restaurant and hotel. Dimension: Width 17" x Depth 24" x Height 37"
With buttoned back, curved legs and bonded leather upholstery, Seriena Melbourne Dining Chair with bonded leather upholstery is elegant with casual feeling. Constructed with solid birch wood. Suitable for home, bars, restaurant and hotel. Dimension: Width 20" x Depth 24" x Height 38"
Made with bonded leather upholstery, Seriena Shanghai Dining Chair is simple yet elegant. Available in deep red, light blue, Ivory leather. Constructed with solid birch wood. Suitable for home, bars, restaurant and hotel. Dimension: Width 18" x Depth 21" x Height 42"
Decorated with deep button-tufting, this stylish and comfortable Seriena Lyon Dining Chair with linen upholstery will add style to your dining room. Available in different colors of Linen. Constructed with Solid Birch wood. Suitable for home, bars, restaurant, hotel. Dimension: Width 19" x Depth 27" x Height 39" x Seat Height 20.5"
With button-tufted, curved back and bonded leather upholstery, Seriena Sedona Dining Chair is very comfortable and elegant. Constructed with solid birch wood. Suitable for home, bars, restaurant and hotel. Customization available with wholesale order. Dimension: Width 21" x Depth 24" x Height 40"
With arched legs, linen upholstery and nail trim, Bordeaux Dining Chair blends modern elegance with classic appeal. Legs are finished with natural wood color. This model will certainly add class to your dining room.Constructed with Solid Birch wood. Suitable for home, bars, restaurant, hotel. Fully assembled. Dimension: Width 20" x Depth 24" x Height 42.5" x Seat Height 20.5"